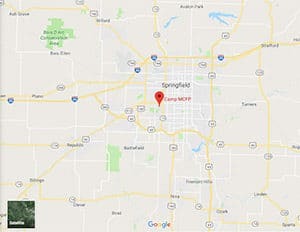 Location: MCFP Springfield is located at the corner of Sunshine Street and the Kansas Expressway, off I-44. Background: MCFP Springfield, originally named the Hospital for Defective Delinquents, was opened in 1933. It provides major medical, mental health, and dental services for the Federal Bureau of Prisons. It also houses a 20-bed psychiatric hospital. Notable inmates include former officer of the Holy Land Foundation Mohammad El-Mezain (serving a 15-year sentence for providing material support for terrorism), publisher of Hustler magazine Larry Flynt (released in 1984 after serving 6 months for contempt of court), and crime boss John Gotti (died in 2002 while serving a life sentence for murder, conspiracy to commit murder, loansharking, illegal gambling, obstruction of justice, bribery and tax evasion). Housing: Inmates are housed in one-person and two-person cells to open dormitories. Health Services: All newly committed general population inmates receive a complete physical examination within 14 days of admission. As part of the admission and annual physical exams for inmates over the age of 50, each inmate is offered a glaucoma test, electrocardiogram, tonometry, and colorectal cancer screening. Periodic health examinations are available based on age specific guidelines. Sick call, emergency care, immunizations, medications, dental sick call, and prescription eyeglasses are also available to inmates. Psychology Services: All inmates at MCFP Springfield are screened by Psychology Services staff during the institution’s A&O Program. Screening may include an individual interview. Each unit has a psychologist assigned or available to it to provide counseling and other mental health services to unit inmates. In some cases, the psychologist has an office in the unit where he or she can be easily reached by the inmates, help develop ongoing counseling programs, or for personal crisis intervention. Mental health services are offered for behavioral and emotional problems. There are many alternatives for inmates who have personal problems and a desire to correct them. These options include self-image groups and other voluntary groups. In addition, MCFP Springfield has professional staff who are trained in the various social science fields. Residential Drug Abuse Program (RDAP): MCFP Springfield houses a Residential Drug Abuse Program (RDAP). It also offers a Drug Education Program and a Non-Residential Drug Abuse Program (NR-DAP). Education Services: MCFP Springfield provides GED and English-as-a-Second Language (ESL) programs. The facility also offers Adult Continuing Education (ACE) classes, a parenting program, and a release preparation program. High school diplomas and post-secondary programs are available through paid correspondence programs. Advanced Occupational Education: MCFP Springfield offers advanced occupational education in Advanced Small Engine Repair and Landscape Maintenance. Vocational Training: MCFP Springfield does not offer any vocational training aside from its advanced occupational education and apprenticeship programs. Apprenticeship: Baker, Barber, Biomedical Equipment Technician, Carpenter, Dental Assistant, Electrician, Housekeeping, HVAC, Machinist, Masonry, Meat Cutter, Orthotics Technician, Painter, Plumber, Prosthetic Technician, Sheet Metal, Stationary Engineer, and Steamfitter are all offered as apprenticeship programs at MCFP Springfield. Library Services: A law library is available with a copy machine and typewriters. A leisure/reading library holds daily newspapers and monthly magazines, as well as fiction and nonfiction books, and a listening library holds video and audio tapes, DVDs, and CDs. Inmates also have access to the TRULINCS Electronic Law Library. UNICOR: MCFP Springfield does not house a UNICOR facility. Commissary: Inmates are permitted to shop once a week on a designated day. Food, clothing, drinks, electronics, shoes, over-the-counter medications, and other items can be purchased. A monthly spending limit of $360.00 is imposed. Recreation Services: The Recreation Center at MCFP Springfield provides fitness equipment, pool tables, games, and a craft workshop (crafts include leather, ceramics, painting, and stick art). The main yard provides a softball field, horseshoes, bocce ball courts, volleyball court, basketball court, pavilion and tables, walking track, soccer, handball, and flag football. The gymnasium houses a music room, limited fitness equipment, and intramural activities.